Dreaming of a White Christmas/ GIVEAWAY!!!! Wow! This coat of fresh snow is simply breathtaking and I just cant get over how beautiful it makes everything look. Don’t get me wrong, I hate the cold. I do however love a white Christmas! This gorgeous dress from Bitter Root Vintage is perfect for the holidays. I was so excited when I found the perfect shrug to wear over it. I mean the sequin accents, you can’t go wrong with that! It completed the holiday look I was going for, and I’m obsessed with it! If you love this dress as much as I do, then you will LOVE this awesome giveaway. Enter for your chance to win a $50 e-gift card to Bitter Root Vintage. They have some of the most adorable dresses I have ever seen. If that’s not enough, I’m also giving away this gorgeous designer inspired crystal necklace as well. You won’t be disappointed. See details below. Beautiful holiday look on you. You are ready for a party. 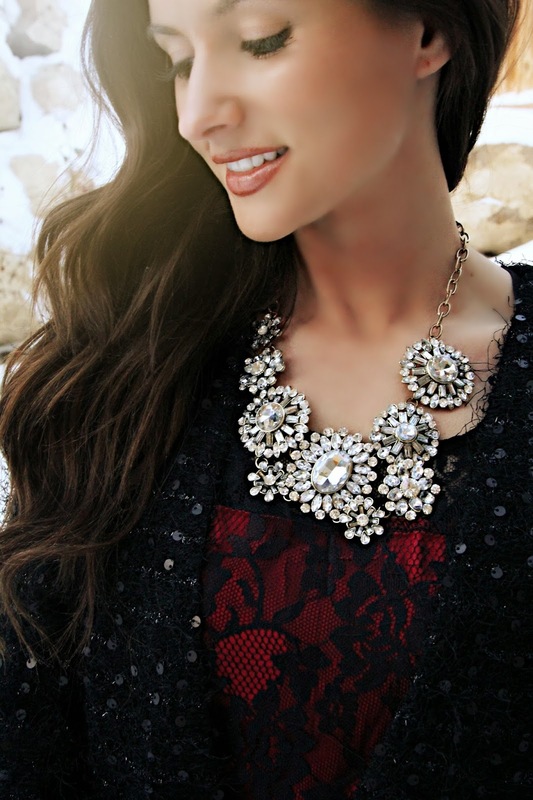 Love this holiday look! Entered your giveaway, thanks! K seriously you guys have the cutest blog ever. Your fashion is crazy fabulous, like I want to steal everything out of your freaking wardrobe. Just sayin'! haha! Love you two! Really love the fashion blog, keeps me up to date in new styles!!!! such a cute holiday look!!! YOU are GORGEOUS!! Love your cute blog – just found it through Wednesday Style Connection link up. I love all of your outfits that you create! They're very fashionable! Thank you for the chance! I'm in agreement, I love your fashion posts! !